Rabbi Cohen and his children, Shlomo and Rochel, visited GSAL with a mobile sukkah during the festival week of Sukkot. The festival commemorates the time when the Israelites were in the wilderness after they had been freed from slavery in Egypt. The roof of the sukkah is traditionally made out of branches so that the sky can be seen. 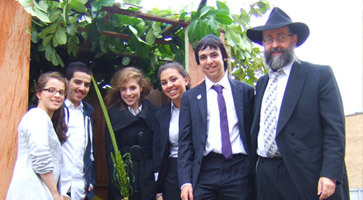 Pictured in the sukkah (L-R) are: Rochel Cohen, Shlomo Cohen, with Hannah Myerson, Liora Tamam and David Lee, three of the four GSAL Heads of Jewish Faith, and Rabbi Cohen. Not photographed is Daniel Saffer.